"Before even being tried by legal authorities, [women] are taken to a place called ‘Gasht-e Ershad’ [Guidance Patrol], where they can be harshly beaten up." "Whether a case is opened for them or not is not important. The illegal punishment they have had to bear has always been much more than what is foreseen in the law." "He was neither an outlaw, nor dangerous, nor rebellious, he didn't deserve this. I have no doubt." "This kid was neither political nor a protester, nor a rebel, nor an outlaw, he had simple but big wishes for himself, like making his mother happy!" "Why should he be killed?" Vida Movahed, known a the "girl of Enghelab Street", arrested for removing her headscarf and triumphantly waving it about became an international symbol, an icon of the protests that swept Iran. She swirled her hijab in the air signifying freedom, protesting Iran's compulsory hijab law. She has been arrested for the second time. The first time was when the regime had made an announcement that it was prepared to relax the punishment women in Iran could expect for failing to adhere to strict Islamic dress code, on December 27. According to police, women who wear cosmetics and loosen their headscarfs will be taken into custody where they will be retrained as it were, exposed to "Islamic values" classes in a kindly, paternalistic gesture, to re-orient them in what Islamic values and the culture of obedience really mean. She was considered to have been taken into custody; perhaps abducted officially is just as reliable a descriptive, but no one has any idea where she is, there is no information available and her whereabouts represent a mystery. Vida Movahed, 31, is the mother of an infant; her current whereabouts unknown. There is no mystery about what has happened to other young Iranian 'deviants' whose defiance has angered the theocratic regime, fuming in rage over the impudence of the thousands of Iranians who, day after day, risked their safety to confront the Ayatollahs with their anger over the scarcity of basic foods and consumer goods during a time of enforced consumer restraint that coincides with ample funding for terrorist groups and Islamist Shiite thuggery in Syria and Yemen. The protest marches brought out thousands of enraged Iranians who see little value in their government and its strictures upon the population, much less its focus on funding terrorism. They chanted the downfall of the government in a stinging condemnation of the Supreme Ayatollah Ali Khamenei and the country's 'moderate' President Hassan Rouhani. After weeks of spontaneous protests and marches throughout the nation's towns and cities, the Presidential Republican Guard corps was called out to replace security police in quelling the protests which at times turned into riots. Students protest at the University of Tehran on December 30. An estimated 4,000 Iranians were detained and arrested while 25 people died during the protests, and there were several deaths among those who were incarcerated; sometimes torture does lead to death, a well known reality in Iran. The official line is that three young men among the over two dozens simply died while in prison; of unknown causes, presumably. A young woman who was tortured and died was returned to her family for burial with a denial of any responsibility for her death. Iranians are now insisting on investigations taking place into prison deaths. "This news of so-called suicides is making people angry; they demand answers", Farshad Ghorbanpour, an analyst with ties to the government declared. Top Iranian judicial authorities seem uncertain how to address the demands of the mainstream public in Iranian society repudiating the government narrative. In this nation of 80 million souls, retribution can be the reward for such behavior. Hundreds of the detained have now been released, but the public insists on knowing the truth of the prison 'suicides'. Those who died in detention, according to national prosecutor Gholant Hossein Mohseni-Ejei, had "committed suicide". It should be taken on trust in his honour that "none of the bullets" found in those who were killed matched the kind in use by police officers and the military in Iran. Friday Prayer leader Kazen Sadighi, rebuked the protests, naming protesters as "garbage". 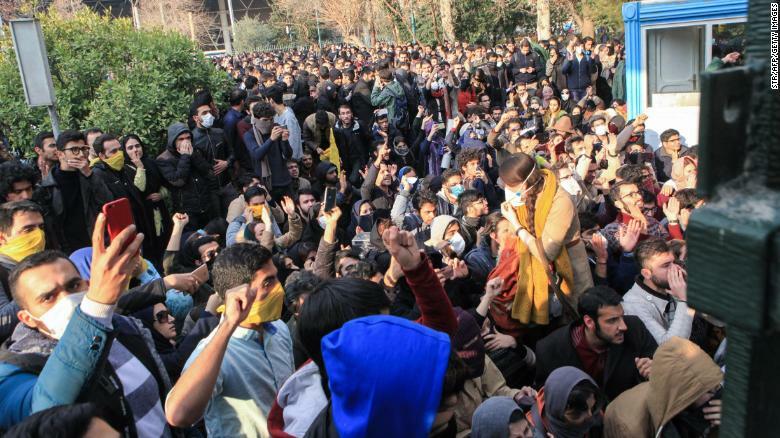 Authorities lifted their ban on the app Telegram used by half the population for phone messaging on January 13 after Iran's National Security Council suppressed its use in an effort to put a halt to news about the protests. As soon as the app was once again available it became the conduit for accounts of the prison deaths and skepticism became rampant in the population. In Arak in central Iran, Vahid Heidari, a street peddler was arrested for possession of drugs, the charge judicial authorities brought to bear against him. Abbas Qassei, city prosecutor claimed that video footage showed the man stabbing himself with a knife. The video was not released, and no explanation ensued as to how Mr. Heidari obtained a knife in his prison cell. In dreaded Evin Prison, Sina Ghanbari, a 23-year-old student, hanged himself in a bathroom on January 6, according to judicial authorities. Another man, Saru Ghahremani, an Iranian Kurd of 24, was arrested at the protest. Mohammad Ebrahim Zarei, governor of Sanandaj identified Ghahremani as an associate of a "terror group" who was, unfortunately, killed in a clash with law enforcement agents, according to the official Islamic Republic News Agency. It was that explanation that brought Iranian actress Bahare Rahnama to tweet her disbelief. The governor's office then asked her "not to spread false rumours", and she deleted her tweets taking exception to the prosecutor's explanation of the "terrorist" Saru Ghahremani's unfortunate death.